Director of the MCH’s Department of Dentistry, Dr. Stéphane Schwartz, reminds us that caring for your child also involves looking after their teeth. If the teeth are not well looked after, your child’s quality of life may be affected; they may even stop eating. “Remember that dental caries (or cavities) are a chronic infection caused by bacteria. We need to remove these bacteria, because they grow and multiply quickly.” Dr. Schwartz has developed three simple steps to care for children’s teeth, which she has named the Gold Standard of Care. Baby’s teeth begin to push through their gums around six months. Examine both the front and back of the tooth to make they are white and shiny. Dull, discoloured patches may be an indication of caries. Use small, soft bristled brush to remove the plaque on your child’s teeth. Apply only small amount of fluoridated toothpaste, the size of a grain of salt, on the brush, as children may swallow it. This should be done at least twice-a-day and both the gums and teeth should be brushed. Until your child can write his name, he is generally not coordinated enough to do a good job of brushing his teeth alone. However, electric toothbrushes are good alternatives. As sugar accelerates tooth decay, it is important to limit the amount in your child’s diet. If possible juice, should be given in a cup, rather than a bottle and children should never go to bed with a bottle. Make sure snacks are healthy, such as fruit, vegetables and cheese. Try to avoid chewy candies and limit dried fruit. 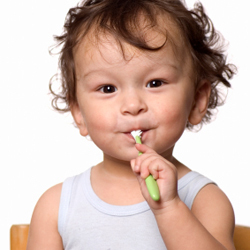 Children should have a dental exam around their first birthday to diagnosis any potential problems. In areas where the water is not fluoridated, fluoride supplements may be a good option. The above tips have been written for the care of children, but they also apply to adults. Flossing is also an important way to remove plaque, as brushing alone only removes 56 percent of the bacteria. “The last thing in your mouth before bed should be a toothbrush,” says Dr. Schwartz.